32-bit AVR flash microcontroller featuring 64KB Flash, 16KB SRAM is designed for industrial and automotive control applications, optimized for fast communication and motor control. The device family features a floating point unit, FlashVault code protection, single or dual CAN interfaces, dual LIN interfaces, USB with OTG, PWM with dead-time insertion, a 16 channel 12-bit ADC with dual sample-and-hold circuit for simultaneous sampling of 2 signals, a 2 channel 1.5 Msps 12-bit analog DAC. 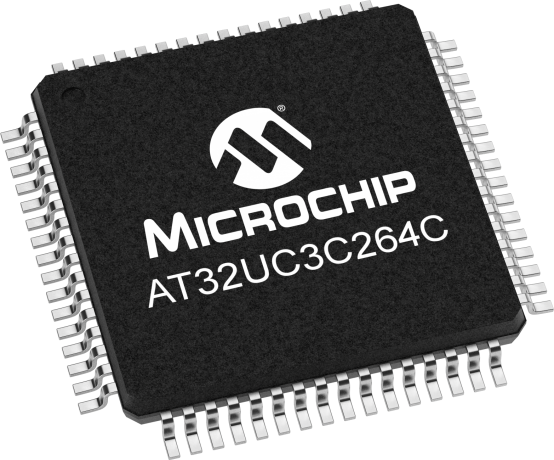 Designed with the multi-layered databus, 16KB on-chip SRAM with dual interfaces, the AT32UC3C offers an outstanding data throughput. The AT32UC3C Event System provides a connection between on-chip peripherals to off-load the CPU, saves power consumption and provides a 100% deterministic response to external and internal events.